As one of the biggest grilling weekend just passed (Memorial Day in the US), we thought, why not throw up another grillable meal? How about this “deconstructed souvlaki” we threw together recently? Ok, so souvlaki is traditionally made with pork and it’s always skewered, but if you order “ena souvlaki pita” in Greece you’ll supposedly get meat off the skewer in pita, with tzatziki, tomato and onions. 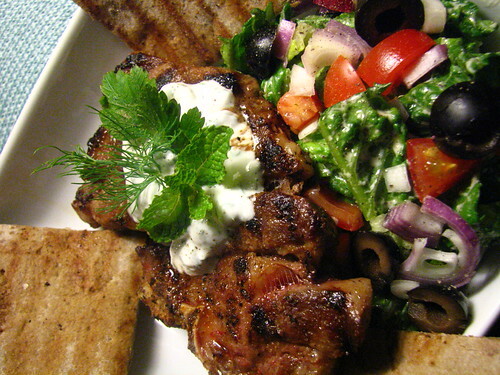 Instead of tzatziki, we made a thick herb yogurt “sauce” to top our lamb and grilled some pieces of pita to eat along with it. We also made a Greek-inspired salad on the side just to kick the healthiness up another 10 notches. Using a knife and fork always helps me eat a bit slower – if this was wrapped up in pita I would’ve scarfed it down in 2 minutes! So give it a try! It’s healthy, delicious and so easy to make you’ll have more time to drink beer, play horseshoes, make a sandcastle and remove the sand from your bathing suit. Awww yeah, summer’s finally here! If using non-Greek yogurt, make sure you drain your yogurt in a strainer lined with cheesecloth or paper towels for an hour or so. The thicker the better, so the longer you let it sit, the better. Mix all your herbs in the yogurt along with the garlic, some lemon juice and salt. Stir and taste for seasoning or more lemon juice . Allow flavors to meld together for at least a half hour. Season your lamb with plenty of kosher salt and fire up your grill or grill pan. When it’s nice and hot, grill your lamb on both sides for about 4 to 5 minutes on each side. Allow to rest for a few minutes before plating. Grill some pita bread next on each side for about a minute. Plate your dish by topping each piece of grilled lamb with the herbed yogurt sauce and eat with a Greek Salad or grill some baby potatoes and toss with olive oil and some chunks of feta or even with some french fries! Sky’s the limit! Nice twist to a Memorial Day BBQ. Just perfect. This looks divine! The colorful salad and yogurt sauce sound like they make the perfect accompaniment. It’s souvlaki (anything skewered gets the souvlaki label) but it’s good Greek-inspired grillin’! I’d eat it. Hey guys! Next time you BBQ just give me a sign! It looks fantastic :D. Are you now going to the Greek side? He he, you two have a gorgeous cosmopolitan kitchen :D.
Well, what a coincidence – I just *happen* to have lamb chops thawing in my fridge and ALL of those herbs growing on my balcony. Guess I know what I’m having for dinner tomorrow night. This looks wonderful! This really looks perfect. I still have lamb in my freezer that needs to come out. It’s really gamey (this specific lamb must’ve eaten something weird), so I think I need to pair it with some good yogurt, herbs and lemon (and I’m tired of making Moroccan with it)! mmmm wonderful as always! oh i’m so jealous we didnt gt to do any grilling now i’m jonesing!! I’d be all over it–this sounds absolutely delicious! I think whether I had a fork or had it wrapped in a pita, I would inhale it, lol. throw in those olives and red onions and tomatoes? Yum. THough why play horseshoes when you can play Bocce? THanks for visiting my blog. That meal looks super tasty. I really like all of the flavours in it. hey stranger, danger! pack me some up and mail please…. are you liking Sunny Anderson? I’ve yet to catch an episode but would really like to! Looks like we were thinking lamb alike! melbourne, we travelled for a good while by tram, I was with my friends Connie and Richard from school, the unique think that struck me was the natural yogart, it changed every thing, now its garlic sauce, can someone explain, what happened.? Not sure – we’re not from Australia. But I can tell you here in NYC yogurt sauce is still used! Maybe someone from austrailia can weigh in. ← Grilling This Weekend? Why Not Give These Recipes A Try?